PHOENIX – Nine John C. Birdlebough High School students recently displayed an array of talents and public speaking skills as they vied for the title of Mr. Phoenix. Cole LaPine (center) celebrates his win as “Mr. Phoenix 2019,” while fellow contestants Riley Munger (left) and Darren Fischel look on. 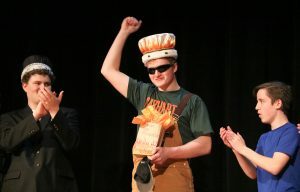 The annual pageant featured male students who competed against one another in several categories as a fundraiser for the class of 2019. Emcees Ashley Margrey, Emilie Hilliard and Gianna DeRoberts introduced the contestants, welcoming Justin Alberici, Cole LaPine, Darren Fischel, Hunter Jewell, Riley Munger, Jock Li, Alan Merrill, Garrett Strang and Noah Gordon to the stage. 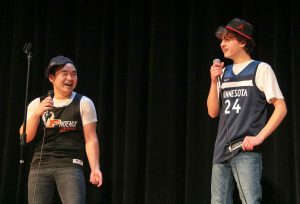 Mr. Phoenix contestants Jock Li and Noah Gordon show off their singing skills and share a few laughs during the recent competition. After several rounds of competition, which included comedy acts, evening wear and panel questions, contestants Fischel and LaPine were tied for the lead. However, a tiebreaker answer by LaPine swayed the judges in his favor and he was crowned Mr. Phoenix 2019. According to JCB English teacher and senior class adviser Lisa Spereno, the competition was a resounding success and it raised $414 for the Class of 2019.